SHAvite-3 is a secure and efficient hash function design by Eli Biham and Orr Dunkelman. SHAvite-3 is based on the HAIFA construction and the AES building blocks. SHAvite-3 uses a well understood set of primitives such as a Feistel block cipher which iterates a round function based on the AES round. SHAvite-3's compression functions are secure against cryptanalysis, while the selected mode of iteration offers maximal security against black box attacks on the hash function. SHAvite-3 is both fast and resource-efficient, making it suitable for a wide range of environments, ranging from 8-bit platforms to 64-bit platforms (and beyond). 23.8.2010 - SHAvite-3's update - identifying a mistake in reference implementation, addressing security issues, and suggesting a tweak. Have it all here. 23.11.2009 - SHAvite-3's bug fix. A small bug in the implementations is fixed, and two confusing typos are resolved. The cleared specifications can be found at here. 15.09.2009 - SHAvite-3 is tweaked. See the tweaked version at here. 23.07.2009 - SHAvite-3 was selected to the second round of NIST. For more information see here. Our original submission to the NIST SHA-3 competition can be found Here. As a result, we had to change the reference code, as well as the test vectors. There was no change in the specification. Our updated submission to the NIST SHA-3 competition can be found Here. Our tweaked (and updated) submission to the NIST SHA-3 competition can be found Here. Due to a small bug in the reference implementation, we have issued a bug fix version. We also resolved two typos that may have confused implementers. The fixed submission version may be found Here. The changes in the code can be found here, and the resolved typos (and changes to the documentation) can be found Here. Please note that we have measured the performance of SHAvite-3 again, and received the same performance as before the bug fix. Some timing results of several versions of our code can be found on the eBASH webpage. The following are our hardware performance estimates. 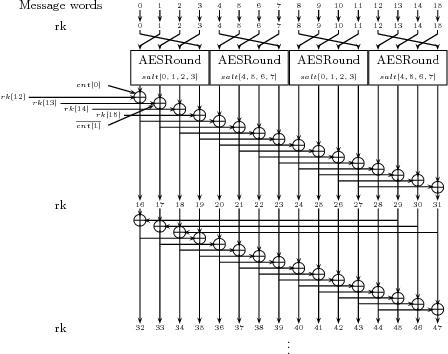 These estimates are based on implementations of AES from 2005, and thus are expected to be much slower than an actual implementation. The following are reports concerning the hardware implementations of SHAvite-3 made by various teams. The original version of SHAvite-3 had one security concern for a specific value of message block, salt, and bit counter. This issue was first reported by Thomas Peyrin, and then further analyzed by Mridul Nandi and Souradyuti Paul (and then some more by us). Specifically, the bit counter has to be zero in order for all the results to work, and a zero counter is used only during the generation of the IVs and in the processing of an additional full padding block, where the attacker cannot use this property to his advantage. Hence, the original SHAvite-3 is a secure hash function. At the same time, as people may wish to use the compression function of SHAvite-3 outside the HAIFA context, we decided to tweak SHAvite-3 to answer this line of research. Eli Biham and Orr Dunkelman - Updates on SHAvite-3 discusses the previous security results on SHAvite-3, and proves that SHAvite-3 is a secure hash function. Contact Orr regarding this website. The design of the website is based on the design of the Haifa Linux Club website we would like to thank the webmasters of that website (besides Orr) for the design.